El Paso, Texas. In the 1980s, Sonoma State University art professors Kurt Kemp and Mark Perlman invite their local hermit to play volleyball. Agreeing, the man receives a kill shot to the brainpan. After dabbing at his bloodied nose, and emitting no words, the woeful hermit plods back to his cul-de-sac cavern. Decades later, Kemp and Perlman remember their victim as Pulitzer recipient Cormac McCarthy. Kemp and Perlman's current collaborative installment at the Sonoma Valley Museum of Art won't wreck your nose, but it will reward viewers with cerebral impressions of how art evolves in memory. 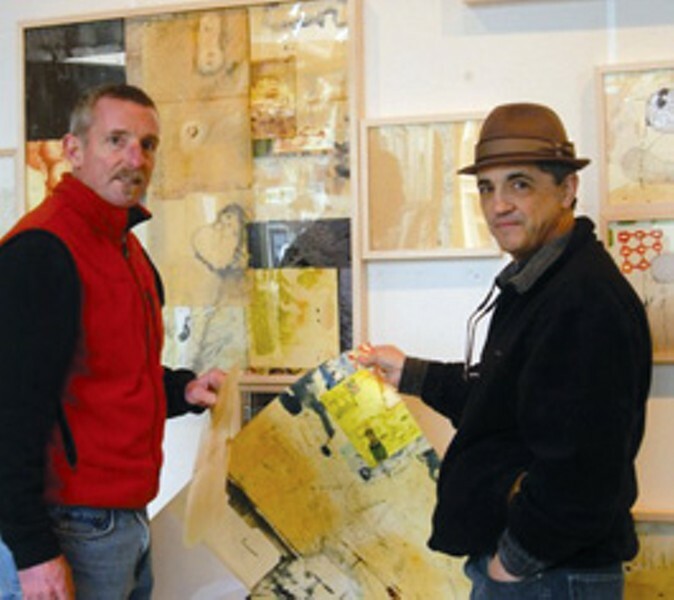 Their exhibit is "Living Walls," two walls of 60 12-by-12-inch works on paper, in the La Haye gallery. The detailed exhibit covers Perlman's various encaustic textures and color—which in part were influenced from rusted mills in Pittsburgh, New Mexico decay and plenty of other dilapidation from North American infrastructure—and Kemp's inimitable and incisive etching talent. Perlman's theme of deconstruction creates stylistic combat with Kemp's constructing forms. "Living Walls" is not only interesting because of combatant styles and extraordinary talent, but because the SVMA enables Kemp and Perlman to work during museum hours. This creates an interactive exhibit, allowing visitors to pose questions to Kemp and Perlman and observe them work this live interaction into the exhibit. The range of influence in "Living Walls" also extends itself to books, music and politics. "If Kurt read a book the night before, those thoughts might enter the piece, or if I say a word or phrase—not necessarily philosophical. Sometimes it's ridiculous as the word 'Hague.'" Besides their collaborative pieces, Kemp has two extraordinary hand-colored etchings titled Man on the Moon and The Man Who Stole Water, while Perlman displays a fantastic piece titled Around About with buttery yet bulleted textures. The exhibit is a beautiful mapping of consciousness, and what it means to reconstruct or create new visual memories. "Living Walls" runs through Feb. 5 at the Sonoma Valley Museum of Art. Working in Residence: Saturdays, Jan. 22 and Feb. 5, 1&–3pm. Closing reception and discussion with curator Kate Eilersten on Feb. 5 at 4pm. 551 Broadway, Sonoma. $5&–$8. 707.939.7862.